Let's Talk Picture Books: What's in a Name? 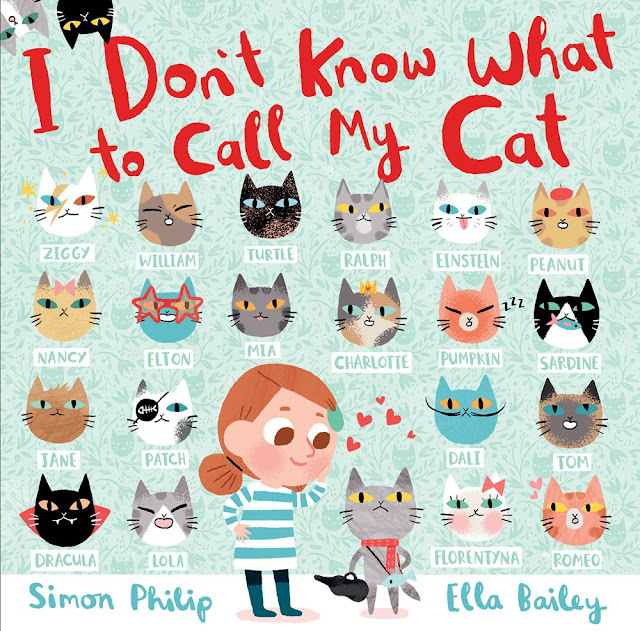 As I said, I Don't Know What to Call My Cat by Simon Philip and Ella Bailey is really the book that prompted these questions for me. In this story, a cat arrives on a young girl's doorstep one day, and seems to hate every name the girl gives it. Of course, the more she gets to know the cat the more she realizes that every name she's chosen so far is a poor fit for a multitude of reasons. And that's the beauty of this book. 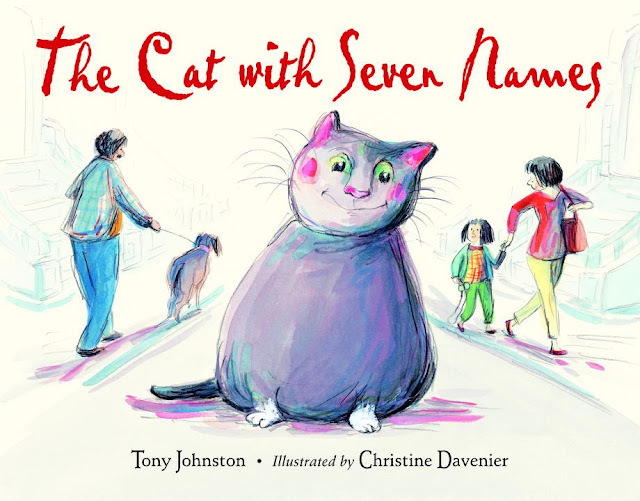 The girl is so quick to name her cat without truly getting to know it (she doesn't even know the gender when she first adopts him), and it's only through learning about the cat's likes and dislikes that she learns that only time can choose a name for the cat. And it often takes a while to get to know the cat in the first place. The Cat With Seven Names by Tony Johnston and Christine Davenier was published a few years ago, but I only recently found it when I was researching this post. The story follows a cat traveling from house to house in a busy neighborhood. 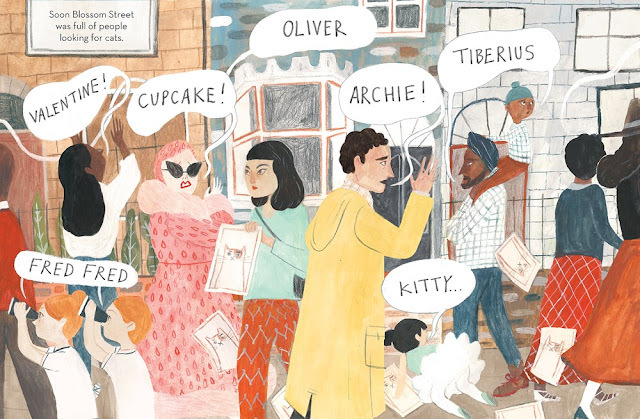 Each neighbor takes a turn as the narrator, shedding light on a different facet of the cat's personality. Of course, with a wandering cat, you can't help but wonder what it's looking for. And when the neighbors finally find out, it unites them forever. The colored pencil and ink illustrations are bright, energetic, and welcoming. We get to see so many sides to this cat as he bounces from house to house, from kind to patient to compassionate. This cat's many names reflect its many personality traits, and each one is a reflection of the neighbor who chooses it. And -- without giving too much away or revealing the name! -- the cat is an example of people will superimpose the traits they're searching for onto others, casting them in a light specific to their needs. 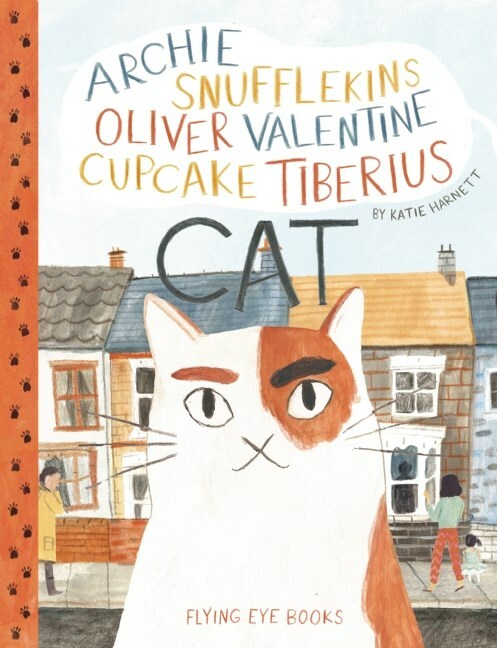 And there's no way I could ever leave out Katie Harnett's debut Archie Snufflekins Oliver Valentine Cupcake Tiberius Cat. At this point I've talked about this book about a zillion times (see here, here, and here), but these are the basics: a wandering cat visits each and every house on his street except for number 11. No one visits number 11. Until one day the cat decides to give the house a shot. Archie (as we'll call him for clarity) is a wanderer at heart, so the fact that he has a dozen names within the span of one book is no surprise. Archie struggles to understand what he wants from the people he meets--no matter what page he's on and no matter what people are doing to please him, Archie is never one to be content. That is, not until he finds the right home. And as we all know, finding the right home is a process: Archie has to walk around the neighborhood trying different things and fitting into different personas before he realizes exactly what he's missing, the woman from number 11. Archie takes his adventure for self-identity into his own paws and learns who he is and what he wants at his own pace.